If you want to win at poker, you need to know how to play poker. There are many ways to learn the game of poker, including taking private lessons from a professional poker player. Unless you’re willing to consider that option, we’ve prepared for you the next best thing - an online poker tutorial, which you can view immediately. Our poker teaching tool is called the Titan Poker Academy, and it’s a simple way to learn how to play poker. This Texas Holdem poker app is a video showing a professional guide to the game, and all you have to do to start is click the button and “start learning.” You can easily learn to play poker online free with this Texas Hold'em tutorial. It’s as simple as that. The Titan Poker Academy is a poker tool teaching poker in a manner that is easy to comprehend and absorb. Using it will allow you to learn how to play the exciting poker game of Texas Hold'em. If you click on the Start Learning button, you can easily navigate your way through the 14 steps of our poker teaching process. To help you understand the game of poker, our poker tutorial shows you how a game round of poker proceeds. Watch this action take place in the flash video, or read the steps of the game tutorial below. Are you ready to use this simple learn to play poker app? Let’s begin. Take your seat at the virtual table. Texas Hold'em can be played online, at home with friends, or in the settings of the fanciest casinos in the world. In our poker video, you'll be seated alongside three other virtual players, and we'll walk you through the moves of an actual poker hand. To start off, you'll see a small white disc on the table, called the Dealer Button. This represents the player who will serve as our virtual dealer. The button moves around the table in a clockwise direction after each hand. Before the first cards are dealt, we want to get some initial money into the pot. Two players make mandatory bets. The player to the immediate left of the Dealer posts the Small Blind, and the next player to the left posts the Big Blind. In our example, we're playing at stakes of $10/$20, so the Small Blind is $10 and the Big Blind is $20. Now the cards are dealt, two to each player, facedown. These cards are known as the "hole cards", or "pocket cards". Only you can see them. The first round of betting begins. The player to the immediate left of the player who posted the Big Blind is the first to move. He has three options for starting the action. He can "call", "fold", or "raise". Each player in turn must decide how to bet. The position in which a player is seated at the table (position = see the illustration) is crucial to making a decision of how to bet in each round. If a player folds, he mucks (throws in) his cards and is out of the action until the next hand. To stay in, a player must at least "call". Bets continue clockwise around the table until the last bet is called. Round of Betting = the dealing of a set of cards and associated betting. For example, the dealing of the river and the bets that follow are a round. ** The flop is dealt. These three "community cards" are dealt face up in the center of the table. All players remaining in the hand try to make the best possible five-card combination of their "hole cards" and the community cards. ** The second round of betting begins, with the player to the left of the Dealer first to choose either to "check", "fold" or place a bet. ** After this round of betting concludes, a fourth community card, known as the "turn", is dealt face up on the table. ** The third round of betting is very similar to the previous rounds. Each player must decide how to act. ** A fifth and final community card, know as the "river" is dealt face up on the table. Each remaining player will know at this point the final poker hand that can be made. The Showdown, between the players remaining in the hand, determines who will win the pot. A final round of betting begins. Each player acts. All players remaining in the hand after this round of betting go to the "showdown", where the best poker hand wins the pot. If a player folds, he mucks (throws in) Hole cards are revealed, although a losing player may elect to muck his hand and not reveal his cards. The cards are then shuffled and a new hand begins. Showdown = after the final bet, when all players show their hands or muck, is known as the showdown. Introduction: Take your seat at the poker table. Texas Hold'em can be played at a table of between 2 and 10 players. The small white disc on the table is called the Dealer Button and it represents the player who will serve as our virtual dealer. This button moves clockwise around the table after each hand. Before the first cards are dealt, two players post initial bets. 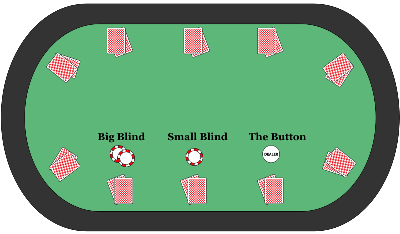 The player to the immediate left of the Dealer posts the Small Blind, and the next player to the left posts the Big Blind. Now the cards are dealt, two to each player, facedown. The only cards you can see are you own. Your two cards are known as your Hole Cards. Knowing your opponents is as important as knowing your cards. Start playing now. 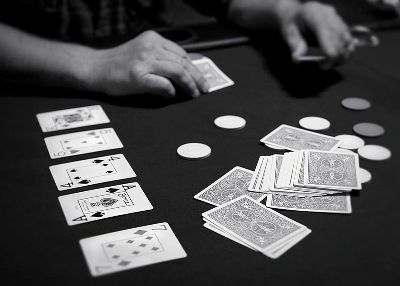 In turn, starting with the player to the immediate left of the player who posted the Big Blind, each player has three options: Call, Fold, or Raise. Each player in turn must decide how to bet. To stay in the action, a player must at least Call. Bets continue clockwise around the table until the last bet is called. Three community cards, known as the Flop, are dealt face up in the center of the table. All players try to make the best possible five-card combination of Hole Cards and community cards. The second round of betting begins, with the player to the immediate left of the Dealer given the first opportunity to choose either to Check, Fold, or Bet. Do you know when to Check, Fold, or Bet? Sit down at the table and start playing. After the highest bet has been called, a fourth community card, known as the Turn, is dealt face up in the center of the table. The third round of betting begins, and again the player to the immediate left of the Dealer is the first to decide how to act. Position is key during the betting rounds. Take your position at the table now. After the highest bet has been called, a fifth and final community card, known as the River, is dealt face up in the center of the table. The final round of betting begins, and again the player to the immediate left of the Dealer is the first to decide how to act. All players remaining in the hand go to the Showdown. All players remaining in the hand reveal their Hold Cards, and the pot goes to the player with the best poker hand. The cards are shuffled and a new hand begins. Do you understand how to play poker? Download Titan Poker and take your newly acquired skills to the tables!